Ion has a lot of ‘alfresco’ concept restuarants/cafes, alfresco within the building that is. Went there on a friday night with dad and surprisingly we didn’t have to wait for a seat. Dad’s cajun wrap came nice and toasty, helpfully sliced into half making it easy to share. 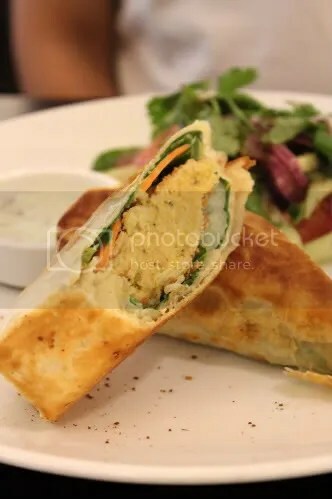 a thin chewy wrap with the nutty flavour of wholemeal made a fantastic pairing with the cajun spiced filling inside. They used a lot of other indian spices to give that exotic taste. Very tasty indeed. For a person who has a natural aversion towards salad, this made a good substitute. 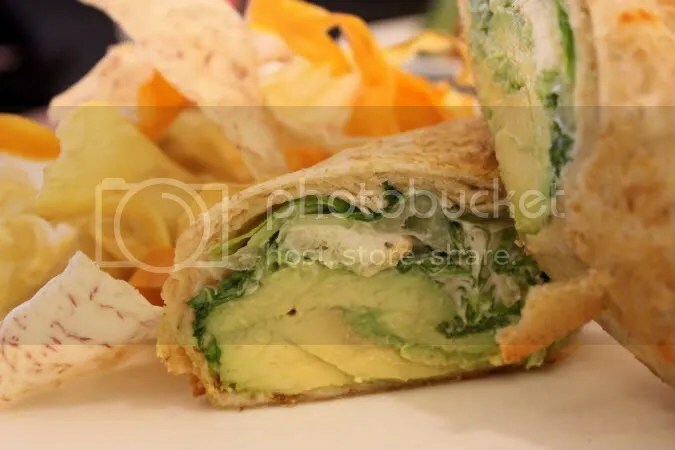 The signature avocado wrap had cold creamy slices of avocado packed tightly within, a thin strip of bread crouton, some leaves and just the right amount of mayonnaise (sounds familiar? It had the same ingredients as caesar salad). A much better alternative to salads in my opinion. The wrap was thicker this time, also toasted but more chewy than the aforementioned. The thinly sliced vegetable chips on the background were a welcome change to the boring (more often than not packeted) potato chips. There were a good many tai-tais and tai-tai wannabes lounging around with their chi-chi handbags and their sticky date pudding. We unfortunately were not in a mood for sticky date pudding but upon observation of neighbouring tables, it seems like the amount of ice cream provided has increased substantially. Still looking as enticing as ever, a revisit to re-try their famed dessert is on the cards.